This entry was posted on Wednesday, July 27th, 2011 at 21:17 and is filed under Politics, Reader Favorites. I come to you with a heavy heart. I hate when these things happen, but I hate it more when they’re swept under the rug. Suffice it to say that this is stunning to me. At 7pm, during the newsbreak between the 2nd and 3rd hours of the Mark Levin show, I heard on my radio a thing that I couldn’t believe I was hearing. It shouldn’t have been possible. It shouldn’t have been real. It should have been only a bad dream, but now I know it wasn’t a mistake. I furiously surfed around until I found confirmation on one website of what I had just heard. Shaking with disappointment and anger, I realized that another Washington politician, in whom I had placed so much hope-filled trust, had just thrown me under the bus. It wasn’t me alone. No, with me went all the Tea Party people and the folks who participated in a “Levin Surge” on his behalf less than a week ago. Under the bus went all his promises, all the now-so-apparent false bravado, and the good will and wishes of millions. What sort of political gun did they put to your head, Congressman Allen West, that would make you think you should abandon all your pledges? Did they use extortion? Did they bribe you? That’s a standard ploy among party bosses. They call it arm-twisting when they threaten to pull any campaign committee financial support, and when they offer funds in support, they can call it whatever they like, but most of us who supported you would call it a bribe. Did they dig up some dirt on you? Did they threaten you with censure for your remarks about that vile congressional Democrat from your neighboring district? What did they do? Was it something worse? Did they find some real personal dirt on you? Of a personal sort? Did they dig up some long lost part of your past that you’d prefer stays buried? What was it? Surely, it’s not for the reasons in the pathetic statement you made on Fox Business. Surely, it cannot be for the sorry arguments you offered on your Facebook page, can it? On that specious logic, you would sell us out and go along with the perfectly useless Boehner plan? Is the fact that they’re spending like there’s no tomorrow indicative that there isn’t, and they’ve just now let you in on the secret? What? Why? How does any man go from “We must stand firm on the debt ceiling,” in a clear and concise declaratory fashion, to the weasel-words of surrender in just a couple days? How does that happen? You know, I wrote you a letter thanking you for your diligent service to our country. Remembering what I wrote, and thinking about what it meant for me to say it, I cannot believe that you would do this without some sort of bully tactic being employed against you. It wouldn’t excuse it, but I would understand it. I participated in a “Levin Surge” launched on your behalf less than a week ago. I defended you against that vile nutcase from your neighboring district. I encouraged you, I took a moral stand with you, and I spoke fondly of your prospects as a future leader in conservatism and in the country at large. I don’t know what’s happened to you, and I don’t know why you have reversed course, and gone off down this rabbit-hole with Speaker Boehner, but whatever it is, at the bottom of it all, what it means is that you cannot be the man I thought you to be. Whether for favor or in fear; for expedience or for false wisdom, you have revealed that you were not what you had led us to believe. All your brave talk, all your tough stands, all of this turned out to be…just a lot of loose talk and posturing. You didn’t just sell me out. It isn’t only the Tea Party. It’s not even the country. You sold out all you claimed to represent, and all the high principles on which you claimed to stand. It’s all gone now. Once again, I put my trust in a politician, and I’ve been betrayed. Worse than that, however, you’ve betrayed yourself, and those pins you display so proudly on your lapel. It took honor to earn them. I wish you had the honor necessary to keep them. I keep hoping something will surface to vindicate you on the charge that now issues from my mind, but I suspect there will be no exculpatory evidence. I’m crushed, and I feel like vomiting. I give up. I feel like just unplugging from all of it . Sharon, I know what you mean. It's just…well… I hate it. I just hate it. I ran into a lady on FB who called me a liar over this. I didn't lie. 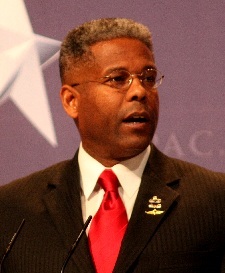 I didn't put words in Allen West's mouth. I didn't write the Boehner plan. I didn't do any of those things. I didn't ask Allen West to cave in and go along. In fact, I encouraged the opposite. I asked him to maintain his pledge to stand firm on the debt ceiling. I don't know what I'm supposed to do… Pretend it didn't happen? Disguise it? Bury it? Sweep it under the rug? The bad part is I am sure the dear lady meant well. I'm sure she thought I was some lefty trouble-making troll. It's not like there is a shortage of those. As she hurled insult after insult at me, and the owner of the page who linked to this blog, I felt sorry for her, not in a patronizing way, but truly sorry. At some point, she's going to realize she's been sold out too. That's sad. It just is. And I'm sick about it. The left wants you to be discouraged. Don't let them. Should I take heart? On what basis? I don't mean to seem to be combative, but what has the leadership of the house given as a reason to be anything other than discouraged? This deal they're throwing together is a stalking horse for Reid's compromise deal which will be shoved down the throats of all of those who've already caved. This looks like a complete con-job, the longer it goes on. I hope you're right, but the evidence is mounting that we're about to be royally…had. Allen has worked for the government his entire life and went to college on the taxpayer's dime. As did his father. It's extremely hypocritical for him to now try to cut money that would help others go to college. Wrong Ben, he earned that education by slapping on that uniform. That's a bit different from a hand-out. Just discovered your blog. Looking forward to reading more. Totally agree about West. I am not fully informed of what exactly Allen did or why Mark has totally turned on Allen, I guess it is because he has fallen in line with John and their current position on the debt ceiling debacle. I do NOT embrace caving in, but nor do I believe in circular firing squads. This political war that is going on is real, it will be critical in the coming election. I am NOT one to give up principles but ..through wisdom, have learned that there IS some value in " living to fight another day". No one is absolutely right all the time. This next Election is very possibly the most important in the history of our Republic. There will be record amounts of Fraud, it will take FAR more than a normal amount of votes in the " Right States" to win this one. The future of our country REALLY DOES ride on that election!! Do not be too hasty to bale on Allen, sometimes discretion IS the better part of Valor!! Whit, I understand your sentiment, but I could not disagree more thoroughly. No one is absolutely right all the time, but I don't know how you advance the position you know to be right by caving to one you know to be wrong. I agree that this will actually be "the most important election in our lifetimes." That said, I do not understand how you (or the Republican leadership) hope to defeat Obama and the Democrats by sticking it perpetually to your base. It didn't work in '76, '92, '96, '06, or '08. It won't work in 2012, either. The ONLY thing to do is to IMPEACH the President, have his administration tried for treason, THEN and onlly then we can pick up the pieces of REAL AMERICAN POLICIES on EVERYTHING THAT HAS BEEN BASTARDISED……THE BS IS SO DEEP NO BODY CAN Walk thru It OR SHOVEL it OUT, burn the barn and build in a new LOCATION ON THE FOUNDATION this Country was built on. I don't think we need to burn the barn, but some bleach and scrub-brushes would be a good start. The foundation's still good. We just need a serious clean-up. i hope we aren't falling for the same delusions that the Dems fell for… that we must place so much naive hope on what we perceive to be, or hope is some "noble black man"
have we "projected" mythological traits onto Rep West that he may not be able to live up to? made him out to be a legislative hero before he even got into office? Tracy, I don't consider race. What I do consider are his outspoken words in the months leading up to this situation. So many had worked so hard to defend him against the scurrilous claims being thrown against him, and recently participated in things like Mark Levin's 'Surge' on his behalf, that it seemed a particularly sore slap. That said, what you offer with respect to politicians generally is wise counsel. Time will tell, as with all things, but given the avid support of so many, this was quite disappointing. I am beginning to think oboma can hypotimitize anyone he comes in contact with. What other reason can we see for so many to go along with so much. It doesn't make sense. crying doesn't help, I know. Sarah Palin is the only one to stick to her guns. Suzette, no, we mustn't cry, but we ought to remember how this all happened. There's something extraordinary happening, and that's where we need to focus!